Cut ham into 4 serving pieces. Mix water and honey mustard in 10-inch skillet. Add ham. Cover and heat to boiling; reduce heat. Simmer about 15 minutes, turning ham once, until ham is hot. Remove ham from skillet; keep warm. Stir sour cream into mixture in skillet; heat 1 minute. Pour over ham. Sprinkle with onions. 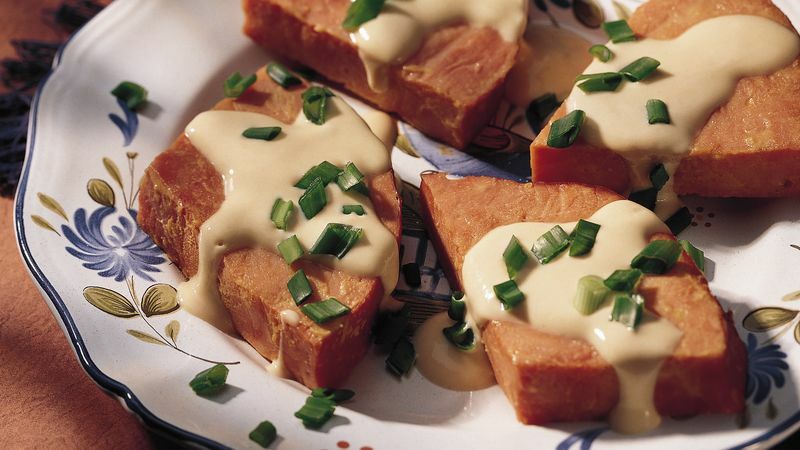 Use reduced-fat or fat-free sour cream for a slightly lighter honey mustard sauce. Can't find honey mustard at your local market? Just stir 1 tablespoon honey into 3 tablespoons of regular or Dijon mustard--you're all set!